Lync Online (part of Microsoft Office 365) is the latest iteration of Microsoft’s cloud-based communications service. In particular, you can chat through text, talk to people by using voice, and even have face-to-face meetings by using your webcam. In addition, Lync allows you to conduct online meetings by using screen sharing, virtual white boards, electronic file sharing, and even online polling. You can think of the Lync application as a one-stop shop for instant communication. Because Microsoft has tightly integrated the Office 365 applications, you can move seamlessly between them. For example, you might be reading a post on SharePoint and want to instantly communicate with the poster. You can view the presence icon and if it is green, that means the user is available. You can click on the presence icon by the poster’s name and instantly send an e-mail, start a text chat, call by using voice and video, or even schedule a meeting. As you are chatting with the poster, you might decide that you want to share screens and invite others to join the meeting. By using Lync, it is as simple as a couple of button clicks. By using Lync, you can instantly connect with others from multiple locations. You might be reading a SharePoint post but you also might receive an e-mail and want to meet with that person right away if he is available. You can see his status on the presence icon next to his name in your Outlook e-mail message. If you want to communicate with this person, you can hover over his Lync presence icon to access the Lync menu. You may want to send a chat message to the user, so you click the Chat button. A chat session instantly opens, and Lync takes care of pulling in the subject of the e-mail as the subject of the chat so that the person knows what the chat is about. It’s almost as good as walking across the hall to talk to someone, only now that someone can be anywhere in the world. An online meeting is nothing new. There are many services that offer the ability to share your screen or coauthor documents. What has finally come together with Office 365 is the tight integration between all the different products. You can now see if someone is available for a meeting right from within the applications, such as Outlook and SharePoint, that you use day in and day out. Using Lync, it is also possible to set up meetings with those outside your organization. Lync meetings enable you to conduct meetings by using chat rooms, audio, video, shared white boards, and even polling. In addition to instant communication, Lync can also contain personal information, such as photos and activity feeds. Being able to put a face with a name is nice. 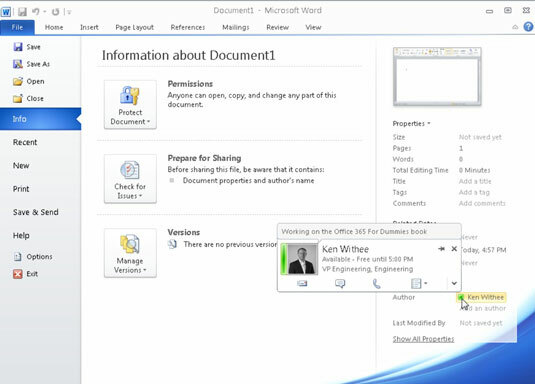 Just about anywhere you might connect with another person, be it Outlook, SharePoint, or the author information property from within an Office document, you can view information about the person. The name of a person will have a presence icon next to it. Hover over the presence icon or photo and then click the details screen.